I am trying to compile a collection of useful documents so that everyone has easy access to things which are relevant to the work of saving the Drill Hall. Sections on here cover information in support of retaining the Drill Hall, Local Government documents, National Government documents, and Heritage organisations. I am not going to duplicate those documents which are already on the Research Site. For those please follow this LINK which leads to information about the Conveyances from JGG Radford to Sidmouth Urban District Council in 1895-6, or this LINK to current Land Registry documents. From these documents it can be seen that part of the land in map ED03 is covered by stipulations that it must not be built on to a height of more than 7 feet ( 2.1336 mtrs). The land on which the toilets stand is part of the Ham Conveyance. Some of the documents below are embedded in the page and can also be downloaded. The technology can sometimes be a bit erratic, so if you see a large empty space instead of the document please refresh your screen and it should appear as if by magic! Documents to support the retention of the building. These documents are not listed in any particular order. 1) Although Historic England has decided not to list the Drill Hall they have clearly stated that it is an important part of the Conservation area. 2) Devon District Council also recognises its worth HER MDV106723. 3) When EDDC applied for permission to demolish the Drill Hall in 2012 their Conservation Officer recommended refusal of the application. ‘It is conceded that the building is in a poor state of repair. No structural report has been produced to confirm its structural integrity and therefore there may be potential for its adaption and re-use. Policy 130 of the NPPF advocates that the condition of a heritage asset should not be taken into account in any decision if the cause has been deliberate neglect. The reasons for the condition of the building are not known but since it has not been well-maintained in recent years should not necessarily be justification for its demolition. I would also advocate that evidence is presented to demonstrate that alternative uses have been sought and suitably dismissed. We don’t know whether this provisional recommendation would have become a final recommendation as the planning application was withdrawn at the beginning of 2013. NB As stated above, because EDDC have done no maintenance on the Hall since this comment in 2012 they can not use the state of the building as reasons for demolition as part of the Port Royal redevelopment. 21st Feb report on 15th Feb meeting. 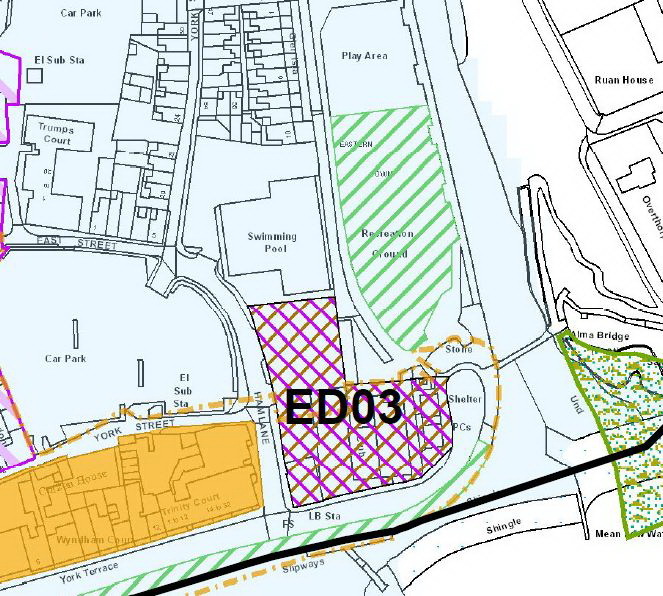 East Devon District Council, Local Plan excerpts. Please note :- The allocation of use for ED03 is on the last page. National Planning Policy Framework. This document covers all aspects of Planning. The section which is most revelant to the Drill Hall is the one detailing the law surrounding Heritage Assets, Listed Buildings, Scheduled Monuments and World Heritage Sites. The Jurassic Coast Management Plan 2014-2019 states on page 17 ( pdf page 12) that there is no formal buffer zone as it is considered that the protection afforded by AONB and Conservation Areas is sufficient. This puts greater pressure on these designations to take the WHS into account at all times.